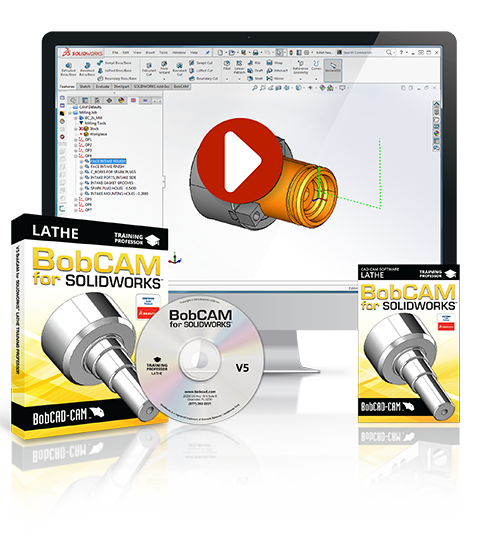 The new BobCAM V5 Lathe Training Professor Video Series gives you the power to master your CAM software for CNC lathe machine programming. This comprehensive learn at your own pace DVD and digital workbook covers everything from setting up jobs with CAM wizards and Dynamic Machining Strategies™ to optimizing turning operations and simulating the job. The training set delivers easy to follow video & written instruction that you can reference again and again. Whether you’re learning the software for the first time, want to sharpen your skills, or need to train new hires; this affordable training solution will have you turning better parts in less time. Also included is a detailed digital workbook that guides you step-by-step through each lesson along with a library of pre-made CAD files that correspond to the tutorials. The lessons are self-contained and portable so you can learn what you want, when you want, where you want.